When Prophet Mohammed (SAW) arrived in Madinah after his migration from Makkah, all the residents of Madina wanted him to stay at their house. To make the decision, the Prophet (SAW) used his camel. The camel walked, and where the camel stopped is where Masjid-e-Nabawi was built. This Masjid became the center for all the Muslims of the city. Prophet Mohammed (SAW) and his family lived in small homes connected to the Masjid. When Prophet Mohammed (SAW) passed away, he was buried in his room, which is connected to the Masjid, and which is now considered to be part of Masjid-e-Nabawi. For our activity, we first talked about where Prophet Mohammed (SAW) lived, and where he is buried. We discussed that his home was in Madinah, and that he moved there from Makkah with many Muslims. Then, we acted out the scene of Prophet Mohammed (SAW)’s camel choosing the location where Masjid-e-Nabawi was built after he moved there from Makkah. My daughter walked around with her stuffed camel and chose the location for the camel to stop, and that’s where we sat down for our activity. Sitting there, we looked at a picture of Masid-e-Nabawi. We noticed its shape and the large green dome. We talked about how all the Muslims, those that lived in Madinah as well as those that had moved from Makkah with the Prophet (SAW), worked together to build the mosque. We decided to work together to build our version of the Prophet’s Mosque. I let her guide the process, giving her a choice of all the materials we had. 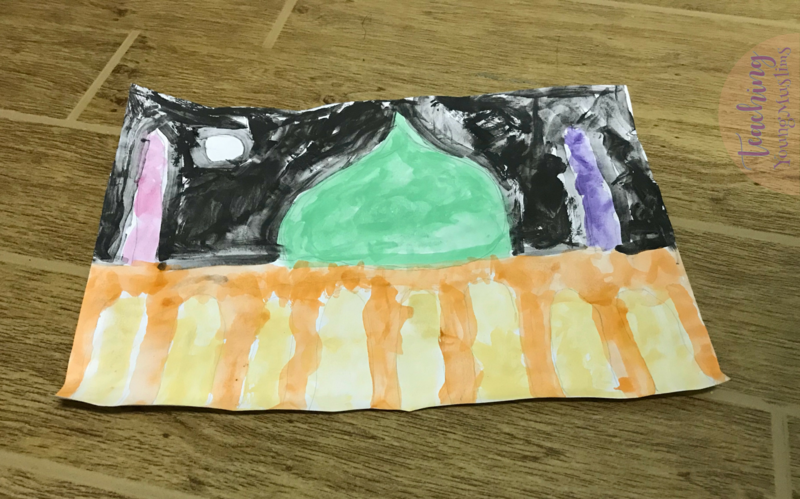 She chose watercolors, and looking at the images that Google gave us after a search of “masjid nabawi,” we drew a rough outline for the Mosque. She decided on a night sky, and I insisted on the Green Dome. After a few colorfully creative initiatives, this is our finished painting. 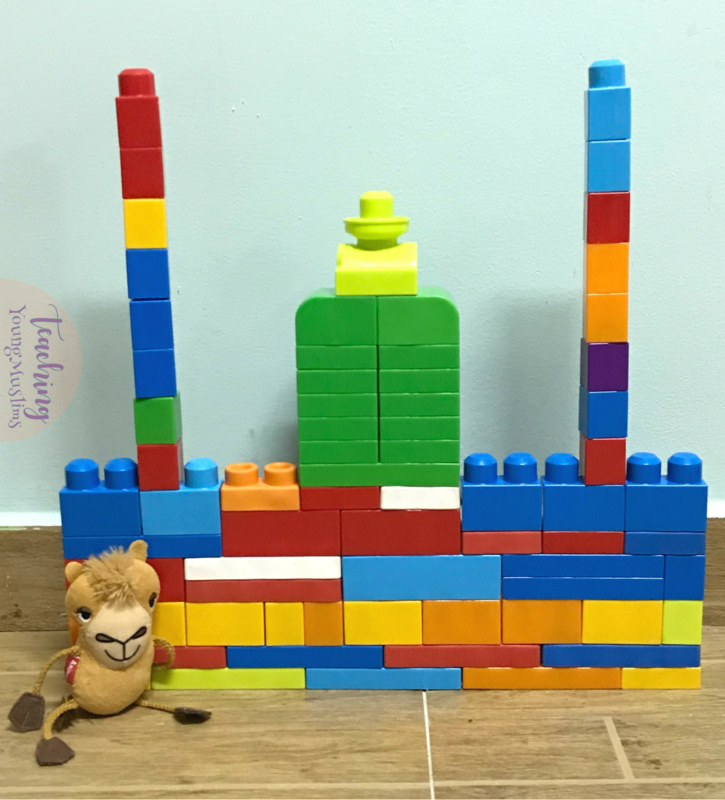 After we finished painting, we decided to make one more version of Masjid-e-Nabawi – with Legos, complete with a green “dome.” Also, featuring our stuffed camel.